An average of 2.25 million gallons of wastewater flows through Joint Base Lewis-McChord's sewers each day -- up to one billion gallons per year. Do you ever wonder where the water goes after you flush the toilet? It flows to the JBLM Wastewater Treatment Plant, then to the Puget Sound. It is a state-of-the-art treatment site. "We speed up Mother Nature's process," said Bob Primm, a licensed Wastewater Treatment Plant operator. Wastewater, known as influent, comes down the hundreds of miles of sanitary sewer pipes and is pumped into a primary sedimentation basins, where about 85 percent of suspended solids are settled and removed. Skimming arms in the basin clean up scum -- floatable material -- and fats, oils and grease, which is pumped off to be processed with the other removed solids. "What you flush or put down a drain has a direct impact on the Wastewater Treatment Plant," said Cindy Trout, water program manager. "Basically, the only thing you should ever flush down a toilet is human waste and toilet paper. Using your toilet for disposal of many modern products can result in blockages." The drains that connect buildings, businesses and homes to the main sewer are often no wider than four inches. The plant is designed to treat only human waste excreted from our bodies, Trout said. Toilet paper is designed to immediately break down once wet. Putting FOG, wipes, feminine hygiene products, dental floss, diapers, food, etc. not only causes blockages in the sewer lines, but damages pumps and impacts the wastewater treatment process. The water then flows through a bioreactor where it is biologically treated to remove the organic waste and ammonia remaining in the water. Then it travels to a micro-filtration system that greatly lowers the turbidity -- the amount of suspended solids that can cause cloudiness in water. "The membrane separation technology draws water across the filter," Primm said. "It looks like a bunch of plastic strands. The water is filtered under pressure and separates the pure water from any remaining solids. The result is Class A reclaimed water. Although the infrastructure is not yet in place, Class A water is for future irrigation through purple pipes." Multiple samples are taken daily across the entire operational process to ensure all stages meet Environmental Protection Agency Permit requirements. There is no need for additional chemicals such as chlorine in the final, tertiary stage of the JBLM Wastewater Treatment Plant. The new facility uses an ultraviolet light disinfection that instantaneously neutralizes microorganisms as they pass through the lights. This technology can reliably destroy 99.99 percent of all bacteria and viruses with only seconds of exposure to the diffused green light emitted by UV lamps. "UV sterilizes bugs so they can't reproduce," said Ben Morrison, Wastewater Treatment Plant operator. "It is much better for final water quality. The chlorine treatment has a negative impact for the water quality and fish once released into the sound." And what about those separated solids? They travel to an anaerobic digester, where the bugs -- naturally occurring microorganisms -- get to work. Organic waste, FOG and pathogenic viruses and bacteria are consumed. The digested solids are de-watered, and plop out into a drying bed. Known as biosolids, they are considered a beneficial resource, containing essential plant nutrients and organic matter. Biosolids are recycled as fertilizer and soil amendments. 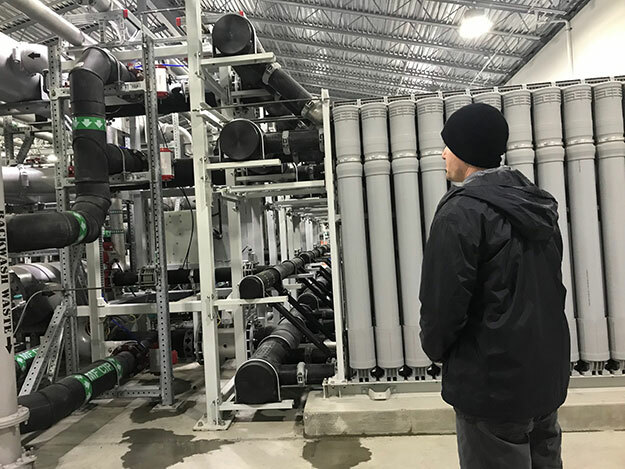 JBLM's upgraded $91 million WWTP facility treatment capabilities are consistent with nearby municipal wastewater treatment plants which also discharge into the Puget Sound. This plant was constructed using the most current technologies and serves JBLM, Camp Murray and the American Lake Veterans Affairs Puget Sound Health Care System American Lake Division in Lakewood. It is designed to meet current and future discharge requirements to protect Puget Sound water quality. The WWTP team's ability to do this is directly related to what gets flushed down the toilet or dumped in the drains. The JBLM community is encouraged to think before flushing, to help keep JBLM's water clean.